1. School started today. HOORAY! Does this mean the library is empty? Well…for about 15 minutes it did. The school year isn’t necessarily quieter during the school year, but the focus is a little different. Storytimes start again week after next and we’re swinging back to after school programming. Homeschooling parents are still in and there are early release days starting next week so we get to play “what school district are you attending and are you truant?” There are also an increasing number of families taking advantage of online education for the K-12 crowd. This works to varying degrees, just as all other methods of education. 2. Book 10 of the 39 Clues is out. I was number 2 on the hold list and I have started reading my copy. 3. Last check of the Mockingjay holds list had us down to 179 in the system with 30 copies. Hopefully readers will continue to turn things over quickly. Audio is looking a little longer, the Branch Princess and I bought four copies but there’s only 1 other copy in the system so far. 4. I added a widget that shows my knitting projects! I know, I know, knitting was broken out of here and sent off to Hedgehog Knitting. My blog, my rules though, right? So if you’re inclined you can click over to HL Headquarters and see little images and my progress. This is pulled in from Ravelry, where I’m pretty good about keeping up with admission of how much wool I buy and just how many projects I have going on at present. Feel free to nag about projects you think I should be finishing. 6. I’m reading Domesday: a Search for the Roots of England (Wood) and listening to Dragon Rider (Funke/Fraser). Blameless by Gail Carriger came out TODAY, so that might necessitate a trip up to BN after work. Because I have copious spare time. 7. I almost have all my long picture books pulled for Wee Reads Part 3. I still haven’t found a chapter book I’m happy with so today will need to be rummaging the shelves again. 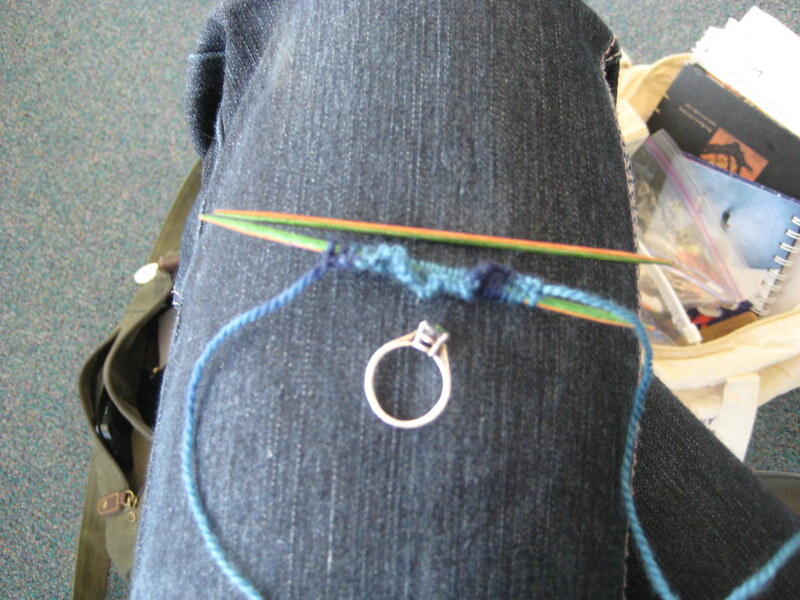 Tuesday was the last knitting session at LPL for my kids. Here’s a picture from our Library Flickr account. I started a child focused knitting group here nearly two and a half years ago for a number of reasons, my own knitting compulsion not being the least of them. It was a small group at first: four or five knitters. Things waxed and waned and when I regularly had six, we counted it a success. Now, I consistently have a dozen to fifteen. Most of the knitters are home-schooled. Only one is in high school, the rest are late elementary through middle school. 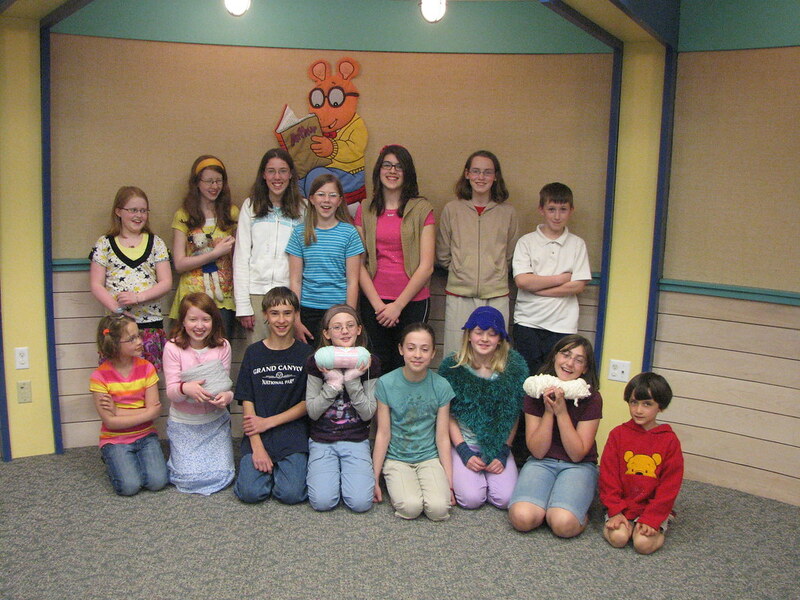 Though one boy has been valiantly with me from the beginning, it was primarily girls. This last session two more boys have consistently joined us, though others have flitted in and out. Over time, things evolved, as they do in all classrooms. I started bringing in piles of books to recommend to them— with most of the books heading directly towards the checkout afterwards. I led two sessions of advanced knitting techniques so that they were confident to pick up patterns on their own and tackle lace without fear. I held a contest and was stunned by their creativity. I taught them how to make needles and stitch markers, and why putting a piece of yarn in bleach can help you determine what it’s made of–which is good when you’ve lost the ball band. I introduced them to Ravelry and we took a field trip far far away to the land of Upstairs Adult Non-Fiction so they could see where the adult knitting books were, as most of my knitters are far beyond the basic how-to-knit books they mass produce for kids, though the Scrapbooker (non-fiction selector) has added what more difficult material she could find. And with the understanding of their parents that it was NOT A LIBRARY RELATED/CONDONED/SUPPORTED FUNCTION: I took a six of them to a yarn store. Seeing their eyes pop as they contemplated all the delicious options was priceless. And they grew–both in skill as knitters and vertically as children are wont to do. From slowly suffering through the knit stitch, the first cast on, the first finished square to the projects currently in progress: two sweaters, three pairs of fingerless gloves, two scarves, three pairs of socks, a couple of bags, and I’m not sure what else… They’ve made Christmas and birthday gifts, knit for new babies and grandparents, but mostly for themselves. I’ve hopefully taught them it’s not wrong to devote time to making something beautiful for yourself. They’re more confident in their craft, even if they are still hoping that I’ll fix all the mistakes and help them figure out what happened when it’s all gone wrong. I’m grateful for the trust of their parents. Children often express themselves more easily when adults aren’t present and while I was always in the room, I was their Fearless Leader, so often I didn’t count as they discussed school, siblings, and life. Parents were supportive as I suggested a social networking site for knitters and cases of new books for their kids to read and talked endlessly about yarn, knitting techniques, knitting books, knitting humor. They brought the kids in week after week after week and let me teach, coach, cajole, and shove. I’m grateful to the kids for their enthusiasm and determination. I ripped out their knitting numerous times and said “Okay, do it again.” I lured book review after opinion out of them, endlessly asking what they were reading. I challenged them to think beyond squares and garter stitch. And I learned more techniques than I can begin to count when–faced with a question or idea–I had to say “Sure, we’ll start that next week.” so that I could frantically run home and find instructions on how one did whatever “that” was. So why end now? Because while it hasn’t died a slow death, things have changed, parents do get tired, and I’d like to see what else we can offer elementary/middle school students. I’m ending with a group of now confident knitters and things have evolved to needing just a minute of my help–and then a lot of socializing while they knit. Certainly they’re welcome to come to the library to do that, and I’ve told them that this ending doesn’t mean they can’t ask for help or book suggestions. I certainly hope they do continue to come and find me. It also means my hobby can moreso retreat to being that, rather than a work obligation, which will be nice. I left La Crosse on Saturday morning and headed for New York. Got to see the Brunette and Husband. Attempted to locate new reading material for the Brunette before he left for his next work trip (he’s picky). Met up with M on Sunday evening. Monday, M and I walked up and down Manhattan, trying on hats, futilely searching for interesting silver, and shunning the spring fashions that were just starting to make their appearance. I’d been able to leave my heavy coat in Queens and wore only a light fleece. In January! After one more meal we headed to the airport. Security was pretty standard, nothing I hadn’t expected. I’d now gone through two sets of airport security with knitting needles and no questions. For the curious, I was flying with KnitPicks Wooden 4″ Double-Pointed Needles, or as I prefer to call them, oversized painted toothpicks. I cast on a project immediately after getting through security in La Crosse and through 4 airports no one even asked what I was making. I did, of course, have extras in my checked luggage. We boarded and were happy to find that we had a set of three seats to ourselves. After a first round of airplane food, we read, listened to music, I did a minimal amount of knitting, we talked…the usual airplane time passing tricks. And we tried, pretty much unsuccessfully, to sleep. This was abnormal for me. I’ve been known to fall asleep before take off. Arriving in Paris at something like 4 a.m. Eastern Time, 9 a.m local, we hustled down the concourse and on to our next gate. I was bleary and my brain wasn’t registering what was said to me in English, let alone polite French, but eventually I gathered I needed to also shed my jacket (not just my shoes) and got my carry-on bag rummaged through again. We had coffee and muffins and eventually we shuttled out to our plane, where we boarded and waited for a couple of hours. No particular reason was given, so we all just hung out and eventually they said sit down we’re leaving. It was a full flight this time and we were seated next to a man heading to work on the oil rigs. We’d left New York in the dark Monday and arrived well after dark in Cairo on Tuesday, total travel time about 16 hours I think? Whatever time it was, I was wiped. We shuttled to the airport, got our passports stamped, and started the search for our luggage. I also flagged down the car service meeting us. Luggage in hand we were passed through a couple of people to our personal car. We hurtled towards Cairo, the guide accompanying our driver chattering a mile a minute about what we were passing and offering to set up various tours for us, which we politely said we’d consider. 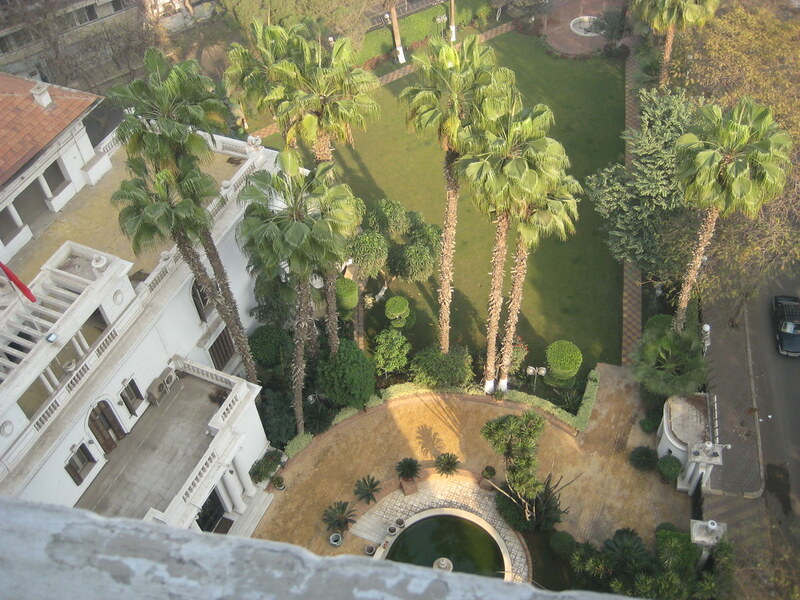 We arrived relatively quickly on Zamalek, an island in the middle of the Nile River, which is the richest area of Cairo and where our hotel was located. Zamalek is a warren of one way streets, abrupt turns, and triple parked cars, as well as the home of most of the embassies, including the one for the US. M and I stayed at the President Hotel, which, we were told, is primarily a Canadian/European travelers hotel. Our room was relatively spacious, with a desk and a “comfortable” chair besides the twin beds with bedside tables. There was a mini fridge that we didn’t use, and a TV where we kept up on world happenings, mostly the earthquake in Haiti and the Senate race in the US. It was clean though slightly worn and we were very careful about using bottled water to wash our faces, brush our teeth etc. Our room had a view over the courtyard of the Chinese Embassy next door. Now local, I phoned our tour guide arranger Mohammed, who joined us at our hotel to review the plans for the next four days. My one page of details and scribbled notes became the basis of all reminders and my travel journal. He also took us to buy water and sandwiches from one of the local delis. Fed and through showers, we adjourned to bed. Cairo continued it’s noise, the noise pollution of car horns, sirens, etc, said to make the city 8x as loud as a city of equivalent size. We would sleep through a light rain and awaken at 4:30 a.m. to the pre-dawn call to prayer. I’m breaking my personal knitting out of this blog. I have some goals and projects I would like to blog at length about but didn’t want to assault all of you with it. Of course, if you read my posts via Friendfeed and Twitter, I’m going to be pulling that blog in so you’ll just see more knitting posts. The new blog is brilliantly named: Hedgehog Knitting. Kids Knitting for the fall ends next week and it’s been gone well. New thing implemented this fall: a six week, half hour Advanced Knitting Techniques. I finish the second round next Tuesday and overall I’d say it’s been quite a success. I have patterns selected that I’d use again to teach the basics and I’ve got some ideas on what to change and do better should I tackle this again. The regular kids group is chugging right along. They bring projects, ideas, and enthusiasm. I show up with yarn, how to knowledge and piles of books for them to read. We average between 10 and 12 kids per week, not a shabby number. The advanced tech was about growing the kids who were moving beyond the basics. I taught I-cord, different types of increases and decreases, cables, lace, and we went over (in detail) gauge and reading a pattern. The general goal was to make them more confident and self-sufficient. Up to this point, most of them had good basic skills. They could do one type of increase, maybe two. They might pick out a pattern but they weren’t confident about reading it and the concept of pairing yarn to pattern wasn’t quite kicking in. Now–they’re doing better. Several of them have moved on to more difficult patterns, coming to me only to read parts of it aloud together. At least three have/are tackled/ing clothing and all of them are learning. I want them to be able to go out and do without me. I’m here to help, certainly, but I don’t want them to feel like they can’t if I’m not available to get them going. I set up pretty strict parameters to do AKT. It had to be kids I’d worked with for at least a few months–I needed to know their level. They, along with a parent, had to come in and talk to me about what we’d be learning, my expectations of them showing up and doing homework, etc. I wanted commitment and I’ve gotten it. I also had to call one kid out of the rug in front of a parent when homework wasn’t done–but while I came down pretty hard, it was done with the intention of reminding expectations that were previously agreed to by the child and parent. Watching the kids blossom is incredibly rewarding. They have the skills, they use the skills and twenty years from now, I’m confident that some of them may still be knitting (and probably kicking my tush in the “difficulty” levels). I packed three of them in the car on Friday for the Ewetopia Fiber Shop open house. (Different three from last year) As always, watching their eyes when they see just how much cool stuff is in a really good yarn shop is amusing and exciting. The possibilities and potential leap off the shelf at you–and it’s in ways I can’t even imagine.